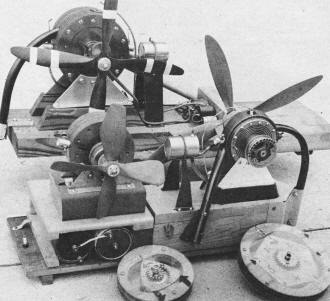 Felix Wankel's rotary engine design was going to set the internal combustion world on fire and make traditional piston-driven engines obsolete. 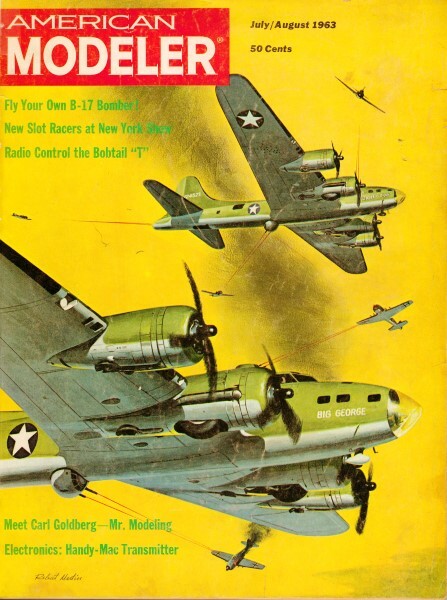 Aside from being revolutionary (no pun intended) from a technology perspective, they just looked cool, and they would be ideal pseudo radials for vintage aircraft models. They operate at high RPMs, have relatively few moving parts, and are lower in both weight and size than equivalent power traditional piston engines. Unfortunately, reality never quite caught up with theory due to heating issues, frequent rotor seal failure, poor fuel economy with attendant poor emissions quality, and other nagging problems. See also "There's a Wankel in Your Future," in the June 1968 issue of American Aircraft Modeler. From the well-known Thomas & Thomas team of experimenters comes that photo of three successful rotary combustion engines which they have built and run during the past 3 years. We'll let William T. Thomas (of the Thomas-Morse biplane) and WTT Jr (Noted model experimenter) give the details: "Our first, a Wankel. (left front) was running in March 1960, and, as far as we know was, with the exception of Curtiss-Wright, the first Wankel to be run in this country. We used model engine practice to seal the sides of the rotor by lapped clearances, and this has proved most successful. Spark ignition is used; fuel is a 3:1 gas-oil mix. At the rear, and at right front are our 5 lobe versions of the Wankel, which are believed to be the only ones in existence. While the Wankel gives one power impulse per shaft revolution, the 5 lober gives two, which is the equivalent of a 4 cylinder, 4 cycle engine. They have perfect balance, only two moving parts, and, we feel, offer excellent cost savings possibilities over conventional multi cylinder engines. One 5 lober would, we feel, be less costly to produce than the two Wankel engines in tandem which it replaces. Our latest one (right front) starts easily by hand, turns two 14" dia., 8" pitch props at 8,700-rpm, with a torque of 150 inch ounces. H.P. equals 1.3. Engine displacement is 0.7 cu inches. so output is 1.86 H.P. per cu inch. 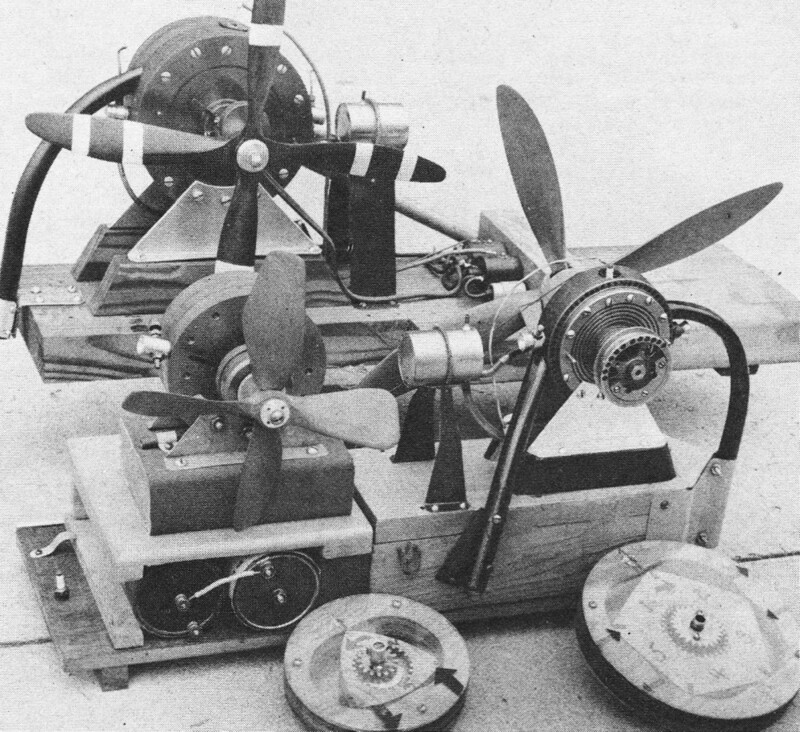 Bill's first 5 lober, pictured at the rear, was designed, built and tested in a span of 35 days, and made its first run on May 20. 1961."